Modi rocks at Madison Square ... more gold at Incheon and Manish Pandey too hits.. There are some cynics who said - Modi was preaching to the converted in New York, and getting an already-eager crowd to chant "Modi, Modi" was hardly something to crow about. But when was the last time you saw an Indian Prime Minister drive an audience to frenzy in New York or even New Delhi? Did the previous PM even draw a polite handclap when he spoke anywhere ! As Modi rocked the big apple enthralling Madison Square Garden …. This is what NY Times wrote : Narendra Modi, the prime minister of India, sold himself on Sunday as a onetime tea vendor who wanted to lift India to glory by cleaning up the country, clearing the way for business and preparing its young citizens to be the work force of an aging world. His speech at Madison Square Garden telegraphed a wish list on the eve of his first meeting with President Obama, while also deftly rallying an influential diaspora to his side. Mr. Modi addressed a wildly enthusiastic audience that was largely made up of Indian-Americans, and played skillfully to their sentiments. He reminded the crowd of the taunts they had heard for years that India was a land of snake charmers, and he offered lavish praise for their success in the United States. They wore his face on their chests, waved it on posters, chanted his name and quoted his slogans, 19,000 fans drawn to a single star. His image stared down from the big screen at Madison Square Garden and emerged on canvas in a live speed-painting onstage. And when the man himself emerged, the capacity crowd on Sunday in New York’s most storied arena roared as one, as if all the Knicks, all the Rangers, Billy Joel and Bruce Springsteen had suddenly materialized. America has seen the future of its relationship with India, and Narendra Modi is the name of the game. 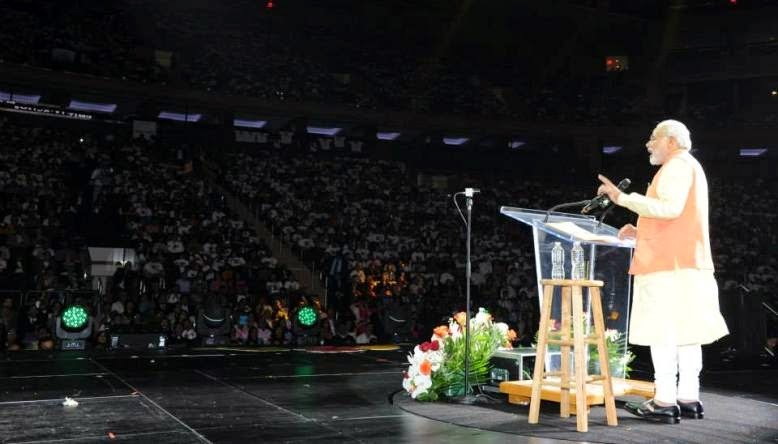 Prime Minister Modi charmed a capacity crowd at New York’s iconic Madison Square Garden on Sunday, reaching out to non-resident Indians with welcome announcements on the visa regime, while exhorting them to join the mission of realising his dream of India. And this is what the famous ‘Time’ magazine had to say : Until this weekend, India’s Prime Minister Narendra Modi had one thing in common with Eric Prydz, the Swedish DJ and electronic dance music star known for his elaborate concerts. Prydz’s shows are audiovisual extravaganzas complete with pulsating lasers, animations and three-dimensional holograms, including one of the man himself. Modi, too, has experience with digital doppelgängers: during the Indian national election in which his Bharatiya Janata Party (BJP) eventually won a large majority, the 64-year-old used the latest in high-tech wizardry to deploy holograms of himself at simultaneous rallies around the country. Now, Prydz and the Prime Minister have two things in common. On Sunday morning, hours after the Swedish DJ finished playing an extended set at New York City’s Madison Square Garden, lines began forming along 31st Street and up 7th Avenue for the next big act at the venue: a “community reception” for Modi, who like Prydz, made his debut at the famed arena this weekend. Nakul is a Tamil film actor and playback singer who debuted in Boys. At Incheon on 10th day of 17th Asian Games, Tennis star Sania Mirza teamed up with Saketh Myneni to clinch the gold in mixed double while Seema Punia also brought glory with her gold—winning act as India maintained the ninth position in the overall standings. Wrestler Bajrang and the men’s tennis combination of Sanam Singh and Myneni picked up silver medals on yet another productive day for the Indian contingent. Athletes OP Jaisha (women’s 1500m) and Naveen Kumar (men’s 3000m steeplechase) and wrestler Narsingh Pancham Yadav (74kg) also contributed to the medal collection by picking up bronze medals. On the track and field, it was Seema’s day as she clinched the coveted gold medal, making amends for her non—participation in the last two Games in Guangzhou and Doha. Bajrang (61kg) was also a star performer as he scripted remarkable come—from—behind victories to reach the final where he ultimately succumbed to Massoud Mahmoud of Iran in a closely—contested bout. The wrestlers continued to provide the much—needed boost to India’s medal collection as Narsingh Yadav also claimed a bronze in the men’s 74kg freestyle event. With the addition of seven medals today, India maintained their ninth position with a total of haul of 42 —— six gold, seven silver and 29 bronze. China maintained their supremacy with a tally of 238 (112—72—54) followed by hosts South Korea 146 and Japan 132. India’s shooters did make it to Incheon but the administrators made it as hard as possible for them regardless. The shooters had to fly half-way around the world and back again because their accreditation cards were not ready. They also had to fend for themselves once they reached South Korea. When customs confiscated Shweta Chaudhry’s gun because the registration number on it didn’t match the form, there was no team manager to sort out the situation. Chaudhry had to run around to arrange a replacement gun just so she could compete on the very first day of the Games. Despite all this, India’s shooters won nine medals, one more than they managed at the 2010 Asian Games in Guangzhou. The incremental increase takes on a much brighter hue when seen through the prism of what came before. At Hyderabad in CLT20, Dolphins are struggling after the brutal assault of KKR – the 18th over of Kyle Abbot who bowled fast and furious symbolised KKR dominance – the 3rd ball was a square drive for 4 that brought Pandey his 50 off mere 39 balls; the next was a 6 over long on; the 5th a full toss was lifted off the front foot for a huge six and last one nicely between backward point and thirdman for a four. The 3rd wicket stand between Manish Pandey and Uthappa was worth 153 as KKR set 188 as target. Manish Pandey touted as the first Indian to score a century in the IPL dazzled today ending up 76 n.o of 47 while Robin Uthappa too remained unbeaten making 85 off 55. 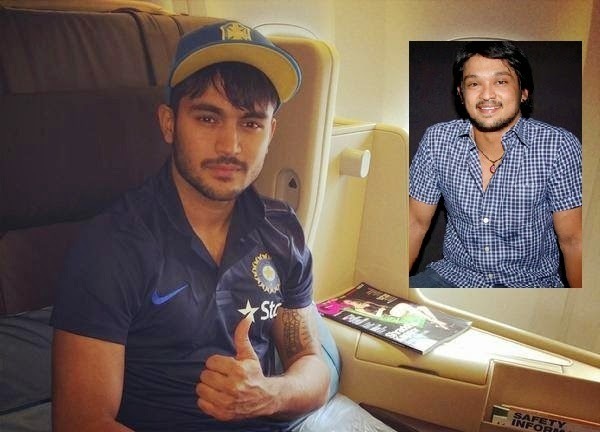 To me Manish Pandey has some resemblance to Nakul who catapulted to unexpected publicity after ‘adra adra nakka mukka’ in Kadhalil Vizhunthen. If statues are symbols – felling them are symbolisms !!!.... ‘Ozymandias’ is a sonnet written by the PB Shelly. Kharkiv is the second-largest city of Ukraine. The city was founded in 1654 and was a major centre of Ukrainian culture in the Russian Empire. Kharkiv was the first city in Ukraine to acknowledge Soviet power in December 1917 and became the first capital of the Ukrainian Soviet Socialist Republic until January 1935, after which the capital was relocated to Kiev. It is in news …. !! Lenin (1870-1924) was a Russian communist revolutionary, politician and political theorist. He served as leader of the Russian Soviet Federative Socialist Republic from 1917, then concurrently as Premier of the Soviet Union from 1922 until his death. Lenin, along with Leon Trotsky, played a senior role in orchestrating the October Revolution in 1917, which led to the overthrow of the Provisional Government and the establishment of the Russian Socialist Federative Soviet Republic. Under his administration, the Russian Empire was replaced by the Soviet Union; all wealth including land, industry and business was nationalized. Based in Marxism, his political theories are known as Leninism. After his death, there was a struggle for power in the Soviet Union between two major factions, namely Stalin's and theLeft Opposition (with Trotsky as de facto leader). Eventually, Stalin, whom Lenin distrusted and wanted removed, came to power and eliminated any opposition. In the Soviet Union, many cities had statues and monuments of Vladimir Ilyich Ulyanov. With the dissolution of the Soviet Union in 1991, many of them were broken with no permission from their authors. Now comes the news that Ukraine nationalists tear down Kharkiv's Lenin statue – the renewed felling reportedly occurred with huge cheers from the crowd as the statue came thudding down. Reports suggest that Ukrainian nationalists tore down a statue of Lenin in the centre of Ukraine's second-largest city, Kharkiv, in a move supported by officials. Pro-Russian demonstrators in the largely Russian-speaking city defended the statue in February, when President Viktor Yanukovych was ousted. Kharkiv escaped the violent unrest which swept through east Ukraine's other regions, Donetsk and Luhansk. A fragile ceasefire has been in place for weeks between pro-Russian separatists in those two regions. 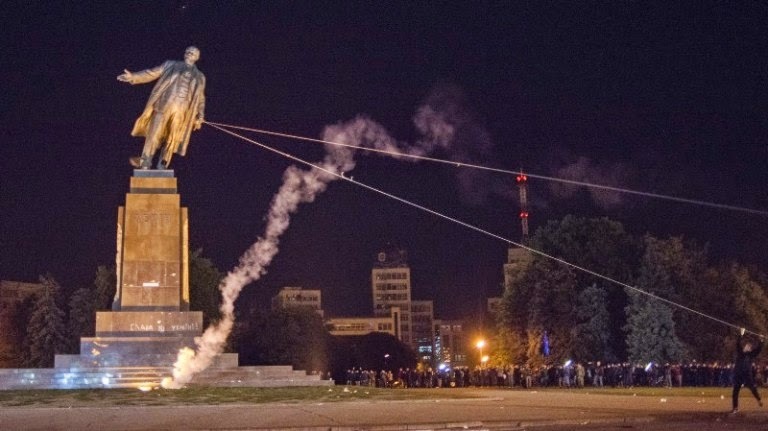 News reports suggest that on Sunday night, when nationalist protesters had already gathered around the statue for a "Kharkiv is Ukraine" rally, the governor of Kharkiv region, Ihor Baluta, signed an order to dismantle the statue. Some correspondents say the order was probably a last-minute face-saving move. Ukrainian Interior Minister Arsen Avakov is quoted as stating on his FB wall - that he had given orders for police to ensure only the safety of people, "not the idol". The so-called ‘Fall of Lenin’ – the Ukrainian movement of toppling statues of the Soviet-era totalitarian leader by strong-willed citizens – began in Kyiv last winter, on December 8th, when Euro-Maidan protesters took down the statue of Lenin near the Bessarabska district. Soon after, over 150 monuments throughout Ukraine were felled by Ukrainians to show that they are eager to part with Soviet symbols and demonstrate their pro-democratic and pro-European outlook. Putin’s imperial ambitions, and the threat of restoring a Soviet-style state, prompted Ukrainian activists to declare a definite “no” to the suggestion of slipping back into Russia’s control. Ozymandias is a sonnet written by the English romantic poet Percy Bysshe Shelley. In antiquity, Ozymandias was an alternative name for the Egyptian pharaoh Ramesses II. The 7.25-ton fragment of the statue's head and torso had been removed in 1816 from the mortuary temple of Ramesses at Thebes by the Italian adventurer Giovanni Battista Belzoni. Shelley wrote the poem in friendly competition with his friend and fellow poet Horace Smith who also wrote a sonnet on the topic. Both poems explore the fate of history and the ravages of time—that all prominent men and the empires they build are impermanent and their legacies fated to decay and oblivion. Away, the destruction of the Firdos Square statue (of Saddam Hussein) was an event in the 2003 invasion of Iraq and marked the symbolic end of the Battle of Baghdad. The Indians who draw crowds of adoring fans are usually tall and sultry, with washboard abs and elaborate outfits, Bollywood stars like Shah Rukh Khan — described by some as the Brad Pitt of India — or Priyanka Chopra, the bombshell actress, singer and model. But this time it is a teetotaler and bachelor who has boasted of his 56-inch chest and wears a simple cotton shirt. Narendra Modi, India’s new prime minister, will receive a rally fit for a rock star at Madison Square Garden on Sunday. ………..writes NY Times….. another tidbit is while Indian Prime Minister Narendra Modi will join President Obama for dinner on Monday and attend a State Department lunch the next day – there is a hitch – as Mr Modi will not have any of the food. He is in the midst of a nine-day fast dedicated to the Hindu goddess Durga and consumes only water or lemon water. At Incheon, Star wrestler Yogeshwar Dutt notched up India's fourth gold medal, while Khushbir Kaur became the first woman from the country to win a medal in 20km Race Walking by clinching a silver as India shot up to ninth in overall standings on the ninth day. Besides, tennis players accounted for three bronze medals through Yuki Bhambri (men's singles and men's doubles with Divij Sharan) and Sania Mirza and Prarthana Thombare (women's doubles). M R Poovamma and Rajiv Arokia won a bronze each in men's and women's 400m race respectively while Manju Bala added another medal of same hue in women's hammer throw. India made a resounding start in kabaddi competition of the 17th Asian Games with both the men's and women's teams thrashing Bangladesh in their opening preliminary round matches at the Songdo Global University Gymnasium. Indian women's team was the first to get across their Bangladeshi counterparts as they trounced their neighbours 29-18 in a Pool A match. The men's team then brushed aside the Bangladeshi men 30-15 to start their campaign on a positive note in Pool A, which also consists of Thailand and Pakistan. In India, people are following CLT20 ….. another disciplined effort from Hobart Hurricanes' bowlers put the side into the semi-finals, with a six-wicket win over Barbados Tridents. Tridents' score of 113 was the lowest by a side batting first in a full game. Yesterday, CSK which had to compulsorily win found the runs too hard to come by. After 18 they were only 115 for 5. In what should have been the 5th ball, Yasir Arafat delivered a high full-toss from around the wicket. Dhoni swivelled, met the ball with the meat of the bat, and sent it soaring into the top tier of the stands behind the deep backward square leg boundary. Next ball was another full-toss, which was despatched over deep square leg, over the roof of the stands, and into the city beyond. Another six and in the end CSK had set a reasonable target and won too…… Lahore Lions offspinner Mohammad Hafeez has been reported for a suspect bowling action by the umpires, following the team's Champions League T20 match against Dolphins in Bangalore on Saturday evening. Dolphins offspinner Prenelan Subrayen was also reported. Indians may not be following Cricket at Incheon as the Board decided against sending teams (and concentrate in CLT20 !!!) Pakistan team captain, Sana Mir, won the toss and elected to bat first. Pak women won Gold by defeating Bangladesh by 4 runs in a rain-reduced match. Sri Lanka won the Bronze medal by defeating China in the play-off for third place. The Sankar directed Rajni starrer ‘Enthiran’ had this song – Rajnikant and AishwaryaRai singing a duet in the background of tribal dancers. The most popular trail for climbing Africa's highest mountain is dismissively known as the "Coca Cola route". It has comfortable huts for tourists to sleep in, food and drink is for sale and the paths are thronged with climbers ~ they say it is no "technical climbing" – still there could be altitude sickness It is a very high mountain. Normally people take five or six days. Travelling 1500-2000m in a day is a lot for one person who lives at sea level. – is what is written about it. 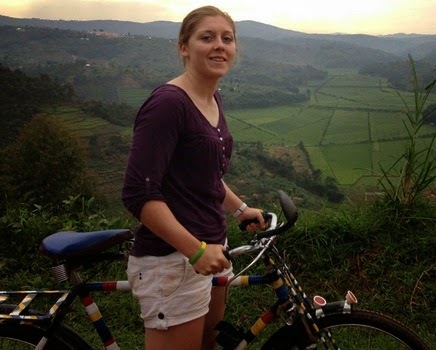 Recently, there was a marriage too - Tanzania's tourism authorities commended two American nationals for exchanging wedding vows on Africa's highest peak. It is Kilimanjaro…… Mount Kilimanjaro, with its three volcanic cones, Kibo, Mawenzi and Shira, is a dormant volcanic mountain in Tanzania. It is the highest mountain in Africa and the highest free-standing mountain in theworld at 5,895 metres or 19,341 feet above sea level. The summit of Kilimanjaro has half the level of oxygen than land at sea level, doubling the energy needed for the match. Climbers run the risk of acute mountain sickness and even potentially deadly pulmonary or cerebral oedema - the flooding of the lungs or brain. Cricket was taken to greater heights …. Not that the standards were raised in any manner………. a plastic track, stumps, bats, pads and plenty of spare balls were all hauled up by Tanzanian porters during a seven-day trek, and qualified umpires were on hand to ensure the game was played properly and eligible for the record. The final score was a winning 82 for 5 for the 'Gorillas' team, led by England women's vice-captain Heather Knight, against 64 for 9 for Giles's 'Rhinos' team. It was unlike anywhere else they will have taken guard, played a cover drive or bowled a ball. A group of cricketers, including Ashley Giles, Makhaya Ntini and Heather Knight, have attempted to set a new world record for the highest-ever match played after setting up stumps atop Mount Kilimanjaro in Tanzania. 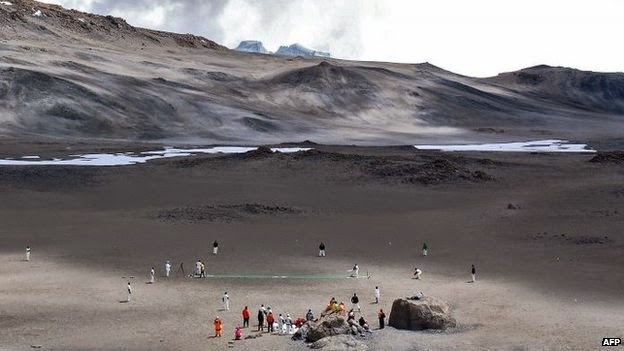 After an eight-day trek to what is known as the "roof of Africa" they played 10 overs per-side before one of the more memorable weather interruptions: cloud stopped play at 5730 metres (18,910) above sea level in a dusty and icy crater just below the dormant volcano's 5895-metre summit. The previous record for the world's highest game had been 5,165 metres, played in the Himalayas at Everest base camp in Nepal in 2009. Players are raising funds for charities including Cancer Research and conservation charity Tusk Trust, which works to stem rampant poaching of elephants and other animals. Funds raised will also go towards building Rwanda's first international cricket pitch. "Kilimanjaro" in Enthiran sung by Chinmayi was a hit. The song, reportedly based on the raga Karaharapriya, had variety of musical instruments – the song was not shot at Mt. Kilimanjaro but in Macchu Picchu in Peru. “Adi vo Alladi Vo Sri Hari Vasamu…. 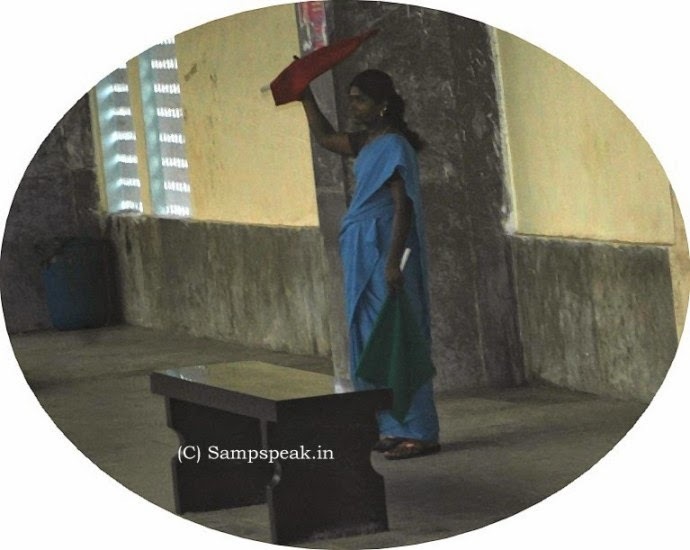 Padi Velu Seshula Padagala Mayamu” … sang the famous Annamayya …. Look and behold, this is abode of Hari- the place where He resides, formed by the hood of Adisesha; places where sages dwell uttering His name all the time; the place replete with riches and prosperity, the Holiest of all places …. The sacred Thirumala, the abode of Lord Venkataramana, Balaji, Govinda. 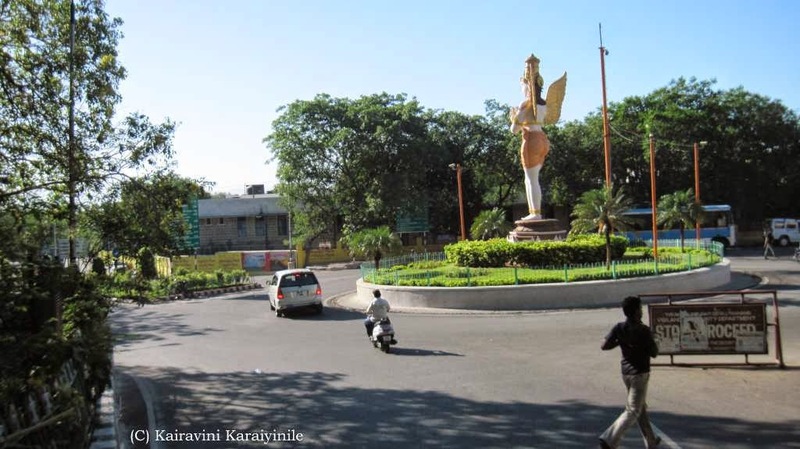 Alipiri is the starting place at foothill of seven hills in Tirupathi, from where pilgrims starts ascending the Holy Thirumala. Alipiri literally would mean resting place. In olden days pilgrims used to climb all the seven hills only through the stepped way on foot, as there was no other option. Hence the pilgrims came from long distances used to take rest for some time there, cooked their food, eat there. After taking rest they started to climb the steps. What was thick vegetation and foothill of a forest has in the recent decade been converted– to a spacious hub where vehicles and persons undergo ‘security check-up’. There are now 3550 steps and for a healthy person would take around 4 hours to climb the hill. The footsteps in most places are well covered and there are shops which make available things to the pilgrims. 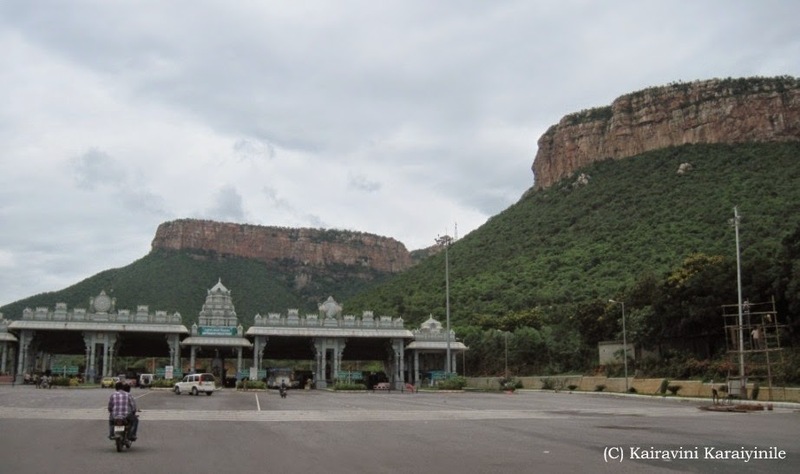 The Tirumala Temple Devasthanam has made good arrangements which include taking care of the luggage of the devotees who ascend the hill on foot. The baggage deposited at Alipiri is carried free of cost and the ones deposited at the foot of the hill can be collected at the top. Also there are arrangement for issuance of tokens facilitating special darshan for them. On the way stands a deer park which attracts people. At any point of time, you can see thousands of people climbing the hill by foot – the pilgrims include children, youth, old people and those with some disabilities – all in the faith and wanting to have darshan of the Lord Srinivasa climb happily singing paeans in praise of the Lord and speaking of the greatness of the Lord. The transformation at this place in someways owes to that ghastly incident in Oct 2003, when the then CM of Andhra Pradesh N. Chandrababu Naidu, survived an attempt on his life when suspected People's War naxalites exploded improvised claymore mines targeting his motorcade on the Tirumala ghat road at 4.15 p.m. Mr. Naidu suffered fractures on his right hand and collar bone and minor injuries on the chest and nose. The impact of the blast was so severe that the bullet-proof car was hurled in the air. The explosion left a huge crater on the road. The car was virtually reduced to metal scrap, but its interior was intact. A catastrophe was averted because the car could absorb the impact of the powerful blast. ……. Years later a Tirupati court on Thursday sentenced three persons -- G. Rammohan Reddy, S. Narasimha Reddy and P. Chandra alias Kesava -- accused in the Alipiri blast case to undergo rigorous imprisonment for four years and to pay fine of Rs. 5,000 each. The final verdict delivered by Additional Senior Civil Judge O. Venkata Nageswara Rao pertained to the second charge-sheet filed in the case. While the trio was being taken away from the court complex amid tight security, the fourth one, Rammohan Reddy, who worked as a sub-editor in a newspaper, claimed innocence and said even the investigating officials could not establish his link. Of the 33 accused in the case registered in Alipiri police station in 2003, 11 died during trial and 15 were still at large. Besides Mr. Naidu, others who were travelling in his bullet proof car, Minister Bojjala Gopalakrishna Reddy, MLAs Reddivari Rajasekhara Reddy and Chadalawada Krishnamurthy were injured. Lanka appoints desi Marvan Atapattu as Coach....will India follow !! A Coach needs to know the nuances of the game too well – should evaluate the players, encourage their strengths, ensure bonding and empower their performing as a team…….. need not be a great performer of hey days …and need not be a foreigner perforce. The island Nation has now has its first full-time local coach in 15 years - the man a vulnerable starter, struggled to make ground in his debut but showed immense strength of character accumulating runs and scored six double-hundreds in his career, a feat bettered only by Don Bradman (12), Wally Hammond and Brian Lara (seven each). Before that Kolkata Knight Riders chased and won against Perth Scorchers keeping the winning habit in tact. When India relies on pace bowling options and plays part-time spinners in T20 (and in ODIs too) – KKR plays with Sunil Narine, Kuldeep Yadav and Piyush Chawla…. ..interesting !! yesterday too, led by Sunil Narine, their spinners were un-hittable. Perth Scorchers realised that after much huffing and puffing that amounted to only 151 for 7. KKR batsmen faltered and eventually a good innings from Suryakumar Yadav and his twin sixes in the 19th over saw them through. Earlier he had hit 2 sixes in 15th over too. Kuldeep Yadav, the 19-year old left-arm chinaman and googly bowler in tandem with mystery carom balls of Narine made Scorchers fumble. For Sri Lanka it is Marvan Atapattu- appointed as first full-time local coach in 15 years. The executive committee "unanimously approved and appointed Mr. Marvan Attapattu to the position of National Head Coach of Sri Lanka Cricket with immediate effect," an SLC release said. 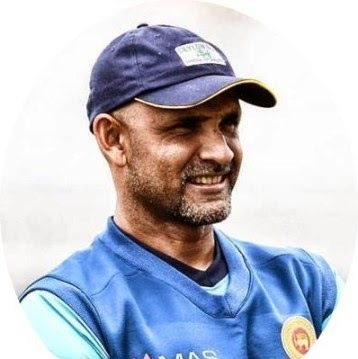 Atapattu was always a strong contender for the position, thanks largely to his intimate knowledge of the Sri Lanka set-up and its players, as well as his success as interim head coach. Sri Lanka's last local head coach, aside from brief interim appointments, had been Roy Dias, in 1999. Atapattu played 90 Tests scoring 5502 runs with 16 tons; in ODIs – in 268 he made 8529 runs and he played two T20s too. He had a forgettable debut in Nov 1990 at Chandigarh out for duck in both innings at Chandigarh – India made only 288 and yet enforced follow-on …….. won by an innings and 8 runs - Venkatapathi Raju had dream figures of 17.5-13-12-6 in the first and 36-25-25-2 in the 2nd. His next chance came in Aug 1992 at Colombo against Australia; he made 0 & 1 – in Feb 1994 at Ahmedabad, he bagged a pair again. After that he next played in 1997 at Dunedin, where he made 25 & 22 and back home in Apr 97 at Colombo, he made another duck and 25. Ken Rutherford, the New Zealander had a similar streak – he made 0 & 0 in his debut in Mar 1985 against mighty West Indies; followed up with 4; ,0,2; 1,5; 65; 0; 0,50*;0;24…..ended up making 2465 runs in 56 tests. Atapattu had earlier been named interim coach following the resignation of Englishman Paul Farbrace in April. Paul Farbrace from Kent enjoyed considerable success as head coach of Sri Lankan Cricket Team, winning the ICC World Twenty20 2014 and Asia Cup 2014; but deserted ranks to join at Assistant coach for England. Remember the stocky Whatmore who toured India under Kim Hughes later became the successful coach of Lanka. He played just seven Test matches and one One Day International. Whatmore was born in Ceylon; his family migrated to Australia in 1962.; retired from Tests, coached Lanka, Bangladesh and later Pakistan too. Train journey is most enjoyable as one can spend time leisurely eating the choicest delicacies looking through the window at the different culture, fields, people and more … as the train chughs past different areas. Interestingly, Indian Trains have Names besides the Numbers. As you would know, Trains now have 5 digit numbers – earlier they were 4 digits. Most trains are named after Gods, rivers, important places in the origin or destination – ……. and regularly more get added to the long list.. some are named after personalities and some after traits too.. there are some luxurious trains like ‘Palace on wheels’ and the recent addition is the ‘Golden Chariot’….. a train which has been awarded the ‘Asia’s leading luxury train’ award at the World Travel Awards, 2013. 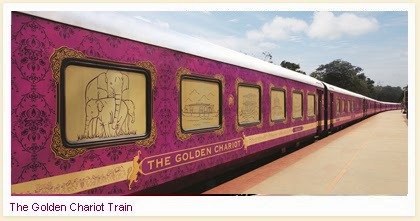 The Golden Chariot is a luxury tourist train that connects the important tourist spots in arnataka, Goa, Kerala & Tamil Nadu as well as Pondicherry, depending on the selected itinerary. It is named after the Stone Chariot in the Vitthala Temple at Hampi. The 19 coaches on the train are coloured purple and gold, and sport the logo of a mythological animal with the head of an elephant and a body of a lion. The train had its maiden commercial run in 2008 and operates between the months of Oct – Mar. 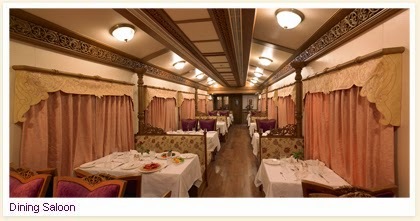 The train is operated by the Karnataka State Tourism Development Corporation and The Maple Group handles the hospitality services on the train. The Golden Chariot offers 2 itineraries. The itineraries are named Pride of the South and Splendor of the South. Pride of the South tour is a 7 nights and 8 days itinerary during which several tourist places including Mysore, Nagarhole, Hassan, Belur, Halebedu, Hampi,Badami in Karnataka are covered. Splendor of the South tour covers tourist places in 3 South Indian states. The advertisement boasts it to be a sojourn through well known & off beat destinations of South India in luxurious fashion. An adventure in comfort, a romance on rail tracks, with heritage & cultural destinations taking through timeless Historical Heritage Sites, Palaces, Wildlife and Golden Beaches. 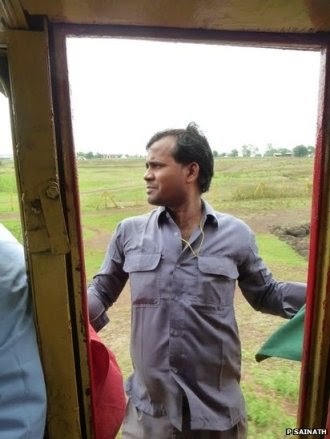 The train is in news because the one carrying Karnataka Chief Minister Siddaramaiah and other members of the entourage was stoned by some unidentified miscreants near Pandavapura on Wednesday as reported in The Hindu. Pandavapura is approximately 130 km from Bangalore and 25 km from Mysore and is surrounded by beautiful paddy and sugar cane fields. The name meaning "Town of Pandavas" myth logically is believed to be the place where Pandavas stayed for sometime during their exile. The Karnataka Chief Minister was on his way to Mysore from Bangalore to participate in the Dasara festival, which will commence from Thursday. 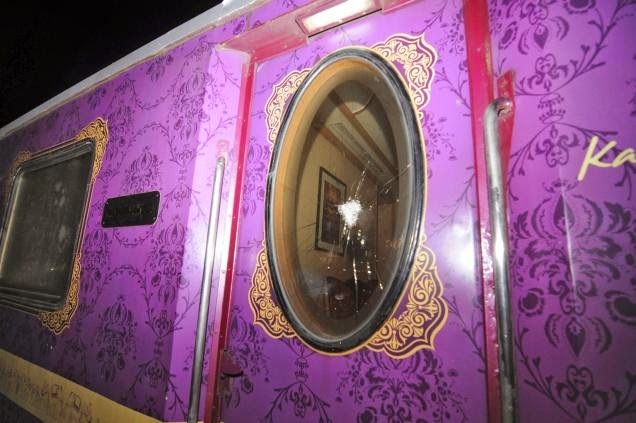 The stone-throwing is suspected to be the work of some urchins, and the window pane of the coach next to which the Chief Minister was travelling, was damaged. 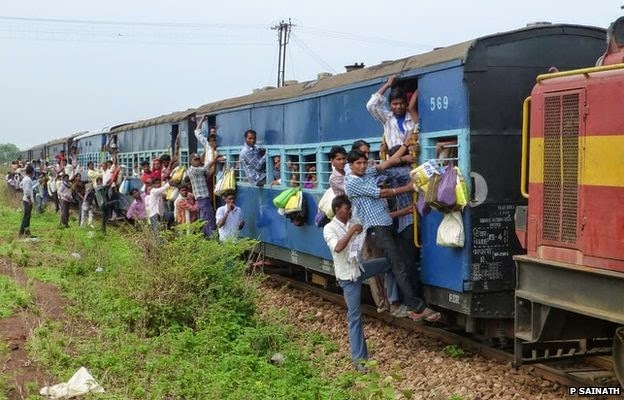 Sources in the Railways said the Government Railway Police were investigating. According to its website, the fare for an Indian National on board Pride South is Rs.22000/- per person per night (Single) and Rs.154000/- for a 7 night journey. In Southern Splendour it is Rs.26400/- & Rs.184800/- respectively. Besides Service Tax a 10% Surcharge would be levied on departures during Christmas / New year. The tariff rate includes accommodation on board the Golden Chariot as also at resorts / conducted sight-seeing tours and entrance fees at monuments. Swimming elephants and rescue at Jaipur ........... !! 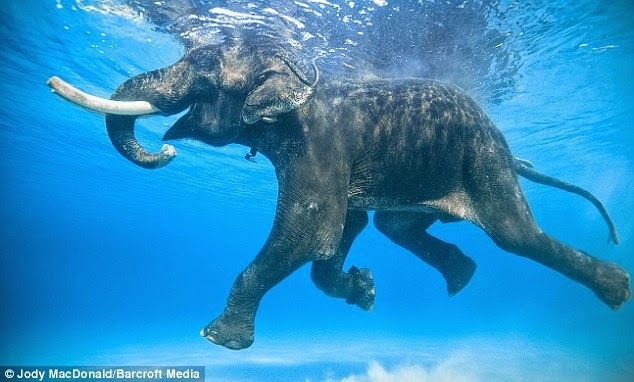 By some accounts, elephants are capable swimmers – still not many can be seen swimming and this one at Andaman is reportedly one of the last breed of ocean swimmers. The video circulating on the web it that of 65-year old Rajan, the world's last ocean swimming elephant who lives on a beautiful archipelago in the Bay of Bengal. Rajan, who weighs around four tons, once worked hard carrying lumber between islands but is now retired—although he still takes the occasional swim for fun. It takes ten years to train a working, swimming elephant and it is no longer considered economically viable with the availability of modern transportation. However elephants are still valued workers and this was reflected in the $40,000 price that Rajan's keepers paid for him. This swimming elephant is a well known celebrity having featured in the Hollywood movie 'The Fall'. Like most elephants, Rajan loves the water and enjoys his swims. Every year many professional underwater photographers and magazine journalists make the journey to the Emerald Isles just to meet and have the opportunity to interact and photograph this amazing swimming elephant. They say that the moment is truly an experience, to see the large Asian male elephant move so elegantly and almost effortlessly in the water. Web reports suggest that the three-ton bull elephant has almost reached the £37,000 target his owners need to pay back the loan they took out to buy his freedom. There is a fee to witness Rajan swimming because his owners at Barefoot India literally rescued him from being sent back to the Indian mainland to work in 2008 by taking out a loan to buy him. ………… this report in Daily Mail (13.8.13) speaks of a big elephant being saved from drowning in a lake. The mammoth was cooling off in the water in the shadows of Jaipur's iconic Amer Fort in India when it started to struggle in a deep patch. 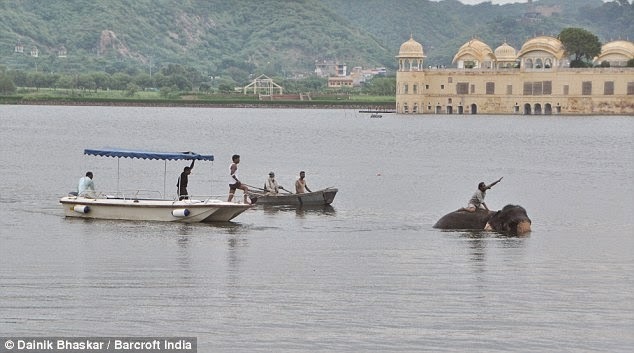 The elephant, named Anarkali, was only coaxed out of the lake when her owner jumped on her back. Anarkali, who gives rides to tourists, was bathing at the lake shore before wandering further into the water. Tourists could only look on as she began to struggle in a pocket of deep water; she was too afraid to move and remained trapped out of her depth. Its owner is quoted as stating that the elephants love cooling off in the water, but after an elephant entered the lake with a tourist on its back last year the administration banned elephants from doing so. The mahout took Anarkali to bath in the shoreline the elephant wandered off into the lake. She only moved back to shore when its mahout leaped from the motor boat onto the elephant's back…. With the help of fellow boaters, he was able to gently coax the confused elephant back to shore, where a crowd of onlookers had gathered. Fortunately, Anarkali emerged unscathed after the efforts to save her. A very happy day – all Indians should be celebrating as India created history today, becoming the first country in the world to succeed on its first Mars mission when Isro's Mangalyaan slipped into Martian orbit after a few nail-biting moments. The country joined the United States, European Space Agency and the former Soviet Union in the elite club of Martian explorers with the Mars Orbiter Mission, affectionately called MOM. Indian Prime Minister Narendra Modi said the country had achieved the "near impossible". Speaking at the mission control centre in the southern city of Bangalore he said: "The odds were stacked against us. Of 51 missions attempted in world only 21 have succeeded. We have prevailed." The Happy News is that India has successfully put a satellite into orbit around Mars, becoming the fourth country to do so. Mars is the fourth planet from the Sun and the second smallest planet in the Solar System, after Mercury. Named after the Roman god of war, it is often described as the "Red Planet" because the iron oxide prevalent on its surface gives it areddish appearance. A proud ISRO reveals that : Spacecraft Successfully enters Martian Orbit; Burn Start of Main Liquid Engine Confirmed; The radio link between the Spacecraft and Earth is now blocked by Mars; Eclipse starts - The Spacecraft is in shadow of Mars……….. The Mangalyaan robotic probe will soon begin work studying the Red Planet's atmosphere. 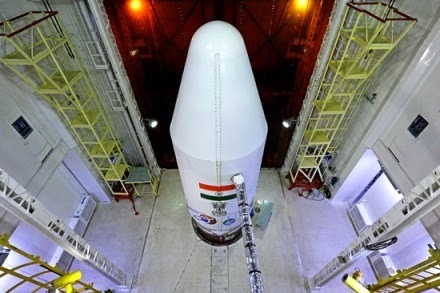 After a 10-month journey, India's Mars Orbiter Mission, also called Mangalyaan, is scheduled to make some final complicated manoeuvres before entering the Red Planet's orbit after 7:30 am (0200 GMT). The Mars Orbiter Mission informally called Mangalyaan was launched into Earth orbit on 5 November 2013 by ISRO. It was successfully inserted into orbit of Mars today - 24 September 2014 making India the only country in the world to enter the orbit in first attempt. The Mars Orbiter Mission probe lifted-off from the First Launch Pad at Satish Dhawan Space Centre SHAR,Sriharikota, Andhra Pradesh, using a Polar Satellite Launch Vehicle (PSLV) rocket C25 on 5 November 2013. Now with the successful entry into Mars, it becomes India's first interplanetary mission and ISRO has become the fourth space agency to reach Mars, after theSoviet space program, NASA, and the European Space Agency. Two weeks before Mangalyaan was lauched, NASA sent off its own Mars mission named Maven. Its cost: Over Rs 4,000 crore. India's mars mission, is worth just a fraction of that -- Rs 450 crore -- and was executed in just 15 months after the government approved it in August 2012. India’s Mars mission represents a technological leap for the South Asian nation, pushing it ahead of space rivals China and Japan in the field of interplanetary exploration. India now has the distinction of becoming the only country to reach the orbit of Mars in its first attempt. More than half the missions to Mars have failed, either crashing or going off course. China’s Mars mission of 2011 was among the failures. At Incheon in the 17th Asian games, Star Indian shooter Abhinav Bindra brought the curtains down on his competitive career with two bronze medals while Saurav Ghosal had to be content with a historic squash silver as India maintained 13th position after the fourth day. Bindra was the star performer as he picked up the individual as well as team bronze in the men's 10m air rifle event, Ghosal narrowly missed out on a coveted yellow metal on what turned out to be a mixed day for the Indian contingent. Yumnam Sanathoi Devi and Narender Grewal also brought laurels for the country by bagging a bronze each in wushu competition. India have filed an appeal with the Asian Games jury of appeal after Narender Grewal was adjudged to have lost his 60 kg Sando semi-final 2-0 to Jean Claude Saclag of the Phillipines. Grewal successful threw Jean Claude to the ground in the first round on two occasions and knocked him off the platform multiple times in the second round. He was the aggressor through most of the fight and to the naked eye appeared to have the edge, but the head judged ruled in his opponent's favour in each round.~ and it is most likely that you do not know who ‘Yumnam Sanathoi Devi or Narender Grewal’ or what the game ‘Wushu’ is… honestly I have not heard of the game till date. Wushu upon searching I read to be both an exhibition and a full-contact sport derived from traditional Chinese martial arts. It was developed in China after 1949, in an effort to standardize the practice of traditional Chinese martial arts. The term wushu is Chinese for "martial arts" - In contemporary times, wushu has become an international sport through the International Wushu Federation (IWUF), which holds the World Wushu Championships every two years; the first World Championships were held in 1991 in Beijing and won by Yuan Wen Qing. Competitive wushu is composed of two disciplines: taolu and sanda. Taolu involves martial art patterns and maneuvers for which competitors are judged and given points according to specific rules. Sanda is a modern fighting method and sport influenced by traditional Chinese boxing, Chinese wrestling methods. Wushu player Thoudam Sanathoi Devi is from Manipur and participated in women's Sanda 52kg category winning bronze medal. 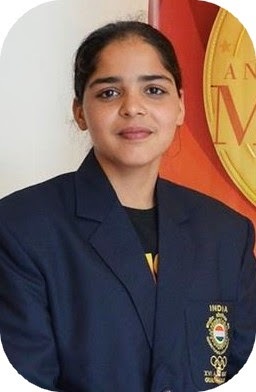 Sanathoi will be the third Indian to win a medal in wushu in the Asian Games while her medal will be the fourth won by the country in the history of multi-sporting event. W Shandyarani Devi won a silver in women's Sanda 60kg in 2010 while M Bimoljit Singh bagged a bronze each in men's Sanda 60kg even in 2006 and 2010. In the men’s Sanda-60kg quarterfinals, world No.9 Grewal was adjudged to have lost his semi-final 2-0 to Jean Claude Saclag of the Phillipines and had to be content with bronze. Before concluding this report in India Today makes a sad reading… On Monday, four shooters of the Indian contingent heading for the Asian Games in Incheon were asked to get off their flight due to lack of clearance for themselves and their weapons. Shooters Shweta Chaudhary, Mansher Singh, Om Prakash, Onkar Singh were all offloaded from their flight despite clearing the customs first, said Verinder Dhall, the manager of India's shooting team in Incheon. Later, the team was told that they were carrying shooting accessories and overweight weapons that did not have clearance, hence they were made to disembark. The shooting contingent put the blame for the failure in coordination and other delays on the IOA. These developments signal that all is not well with the Indian shooting contingent in Incheon that has bagged 4 medals, including 1 gold, till now, and there is lack of coordination between the IOA, the sports ministry, the National Rifle Association of India and the shooters. The shooting contingent is the biggest of the Indian representation at the Asiads and is likely to win more than 10 medals. CLT20 is absorbing …. Only 8th match of the tourney … you have KKR on top of one group and CSK languishing in the same half… At Bangalore, Morne van Wyk, the Dolphins captain, won the toss and opted to bowl saying he had heard the M Chinnaswamy Stadium was a good ground to chase targets. Ever heard of Robert Frylinck- he was the highest wicket-taker at the 2009-10 Standard Bank Pro20 with his right-arm medium-pace. He hails from Kwa-Zulu Natal (KZN) …. He will be heard more as he cleaned up Dhoni for a first ball duck – a rarity ….the last over of Kyle Abbot produced only 5 runs …….. and so you can imagine, which way winds are blowing…. The romance of T20 cricket is the sudden change in fortunes …. Yesterday Cobras had set a target of 186 and looked all set for a victory until that 18th over…….. it was to be bowled by their lead bowler Vernon Philander – who had routed Hobart Hurricanes' final hope having Aiden Blizzard caught on the long-on boundary- Blizzard was walking off the field when he was asked to wait; the umpires wanted to double-check the legality of the ball. The replay gutted Cobras - Philander had overstepped. After 17, Hurricanes need 44 off 18 balls. Cobras certain favourites, but strange things happened. Philander was hit for 24 runs… and in the last two 20 were required Langelveldt bowled – the presence of Adrian Blizzard ensured that there was no last over at all – Hobart won with a over to spare !!!! After Ajmal, today Lahore Lions offspinner Adnan Rasool has been reported for a suspect bowling action, following his team's four-wicket loss to Kolkata Knight Riders in the Champions League Twenty20 in Hyderabad on Sunday. Rasool has been placed on a warning list and can continue to play and bowl in a match. 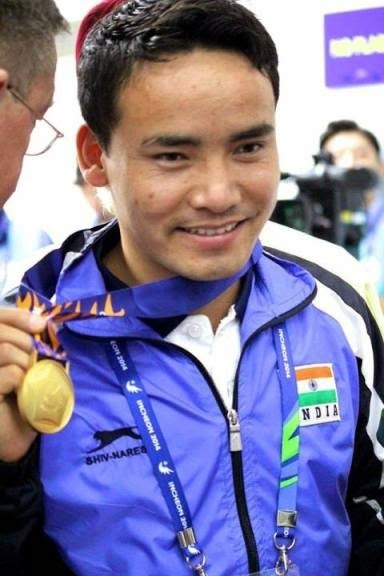 Jitu Rai does India proud .... the new Gold finger..
Incheon, literally 'kind river', a city located in northwestern South Korea, is the centre of attraction now as it hosts the 2014 Asian Games, officially known as the XVII Asiad ……. It is the third time Korea has hosted the OCA’s showpiece event, following Seoul in 1986 and Pusan in 2002. Expectations of improved Indian performance is high in the air – last time (2010) India finished with 65 medals of which 14 were Gold medals. Traditionally shooters have held Indian flag flying high. In the London Olympics, Subedar Major Vijay Kumar excelled by winning silver medal. Earlier it was Jaspal Rana, a gold medallist at the 1994 Asian Games,1998 Commonwealth Games and Ronjan Sodhi who won two silver medals at the 2010 Commonwealth Games and a gold medal at the 2010 Asian Games. ……….. and the new Goldfinger is ‘Jitu Rai’. Not since Jaspal Rana's heyday has India produced a pistol shooter with such a Midas touch as the country's latest shooting star. In the last three months, the Nepal-born Indian Army soldier has produced a run of success to rival the greats of world shooting, winning three World Cup medals, a World Championship silver (with a Rio Olympics quota spot) and a Commonwealth Games gold medal. At Korea on Saturday, he put up a nerveless performance to clinch India's first gold at the 17th Asian Games in the men's 50m pistol event. From his very first shot in the competition soon after 9.30 am local time till the 8.4 he scored with his final bullet at the Ongnyeon range, Jitu soaked up pressure like a sponge. Looking cool, composed and focused each time he raised his pistol to fire at the target, he seemed to be in the 'zone'. It was certainly a great moment for the Nation as the Indian flag went up and the national anthem was played – kudos to Jitu for that golden performance. In the teams event, India finished fourth, behind China, South Korea and Vietnam. Away from the main arena comes the news that Indian Olympic Association has been fined USD 10,000 for withdrawing teams from the Asian Games at a late stage; All India Tennis Association chief Anil Khanna is hopeful that the penalty would be withdrawn. The shooting range has proved good as the women's pistol trio of Rahi Sarnobat, Anisa Sayyed and Heena Sidhu shot down a bronze. Besides the Gold of Jitu Rai, Shweta Chaudhary won the Bronze in women’s 10M air pistol; Jitu Rai combined with Samaresh Jung & Prakash Nanjappa in Men’s 10M Airpistol team to win Bronze. Looking forward to lot more from Team India.